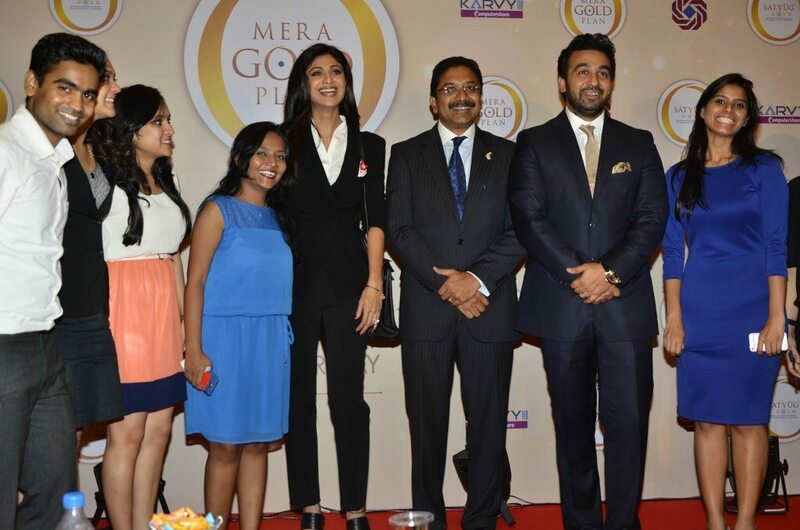 Shilpa Shetty and Raj Kundra endorse gold! Bollywood actress Shilpa Shetty along with her business tycoon husband Raj Kundra announced a new gold accumulation plan ‘Satyug Mera Gold Plan’ by Satyug Gold – a jewelry company promoted by the couple. The event was held in Mumbai, at the Hotel ITC Grand Central on Tuesday, July 8, 2014. Shilpa rocked the business woman look in a formal black suit paired with some visible shinning trinkets. Hubby Raj looked his usual stylish best in a black suit. Raj and Shilpa got married on November 22, 2009. Since the birth of her first child – son Viaan – with husband Raj Kundra, Shilpa has taken on the role of Motherhood seriously. Shipa hasn’t done any major film in a long time, although she was last seen as a judge on Tv dance reality show Nach Baliye season 5.